Current contemporary productions of the Moldavian independent group "Foosbook". Should you be interested to receive additional details, please do not hesitate to contact me. Documentary theater about love in prisons. The performance is based on interviews that were made with both the prisoners and the employees in three prisons in the Republic of Moldova (for men, women and minors). Explanation of the title: Anna is one of the convicts, who was very communicative and also has a tragic history. Shakespeare's "Romeo and Juliet" was chosen as basis for cooperation with the detainees because the main characters are well known and they embody the symbols of love. 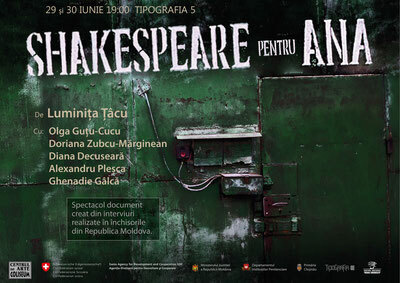 A production based on the novel of Moldovan writer Constantin Cheianu.